Deidre Hollingsworth was released from the hospital the same day as the accident. Ann Hennessey, associate professor of psychology was quoted to say that Hollingsworth has suffered from medical issues, the Roundup has no evidence to support such a claim. Hollingsworth tripped and fell and was then taken to the hospital. She has been released and is back to teaching classes. 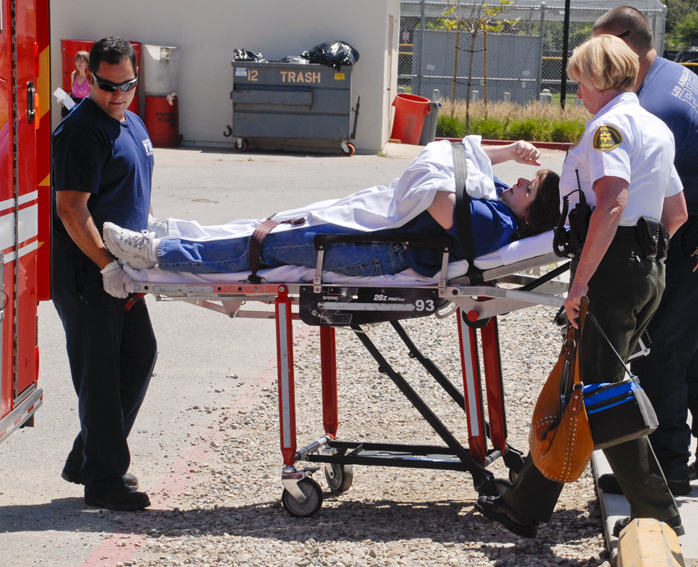 Paramedics responded when a Pierce College professor fell behind the South Gym on Wednesday. Deidre Hollingsworth, adjunct instructor of psychology, was facedown when the Los Angeles Fire Department arrived at approximately 12:50 p.m.
Hollingsworth was conscious and able to respond to paramedics on scene; however, her knees buckled and she continued to bleed while being loaded onto the gurney. Ann Hennessey, associate professor of psychology, confirms that Hollingsworth has medical issues. “She has referred to having medical appointment in the past,” Hennessey said. Hollingsworth was transported to West Hills Hospital.